“I bet you’re wondering about the health benefits of apple cider vinegar. ACV has been all the rage lately and here we will weight the dangers (as well as side effects) and the benefits of apple cider vinegar so you know what the fuss is all about. I bought apple cider vinegar a few months ago. I don’t know why. I tend to buy things on impulse. I heard it’s really good for you and I’ve been meaning to buy it even though I wasn’t entirely sure of the reason behind it. That’s what happens when Kammie has a little extra money to spend. I don’t go blow it on clothes or shoes… I spend it on health food. Yep, that’s me – a total health nut over here. And I’m totally fine with that 😉 I didn’t actually really know very much about apple cider vinegar though. So the first time I ever heard of apple cider vinegar was when my old roommate was talking about it as a possible treatment for sinus issues during winter. She had horrible sinus problems and I had some slight headaches because of it. She said she knew apple cider vinegar was supposedly the cure for it, even though it tastes like crap – apparently if you drink 1 Tbsp of it with water, it’s supposed to give you great relief. So she bought some and she said it helped a bit. 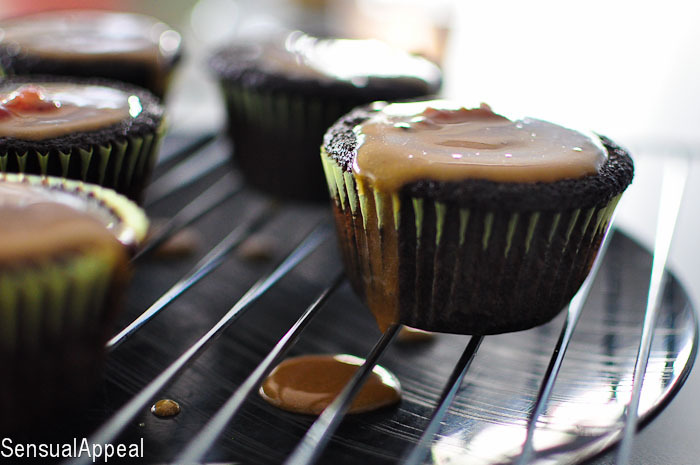 I used it once because a vegan PB&J cupcake recipe I was making originally called for it. This vinegar helped me make these babes… so it can’t be bad! That was the end of that, until I saw more and more bloggers talking about apple cider vinegar as this amazing product to drink upon waking. Laura, PowerCakes, and Jenn have all talked about taking it straight… so I bought it. Yes, bloggers really do have a large influence over me haha. I trust all of you guys, especially if a product appears on multiple blogs! I bought it without really knowing too much about it. I think it’s about time I actually do some of my own research and figure out what all the fuss is about apple cider vinegar! Apparently a lot of clean eating bloggers went crazy for apple cider vinegar when Tosca Reno announced she used it as a way to chase bloat. Apparently, taking 2 Tbsp before each meal allowed her to no longer be bloated after a meal and therefore get flatter abdomen! Some bloggers, like Brittany, have used it and got some nice skin clearing benefits from the mocktail, while others like Erica did not experience that, quite the opposite – she couldn’t stand the taste and had to get off the wagon! I have been drinking a little drink many mornings from the past month or two… no specific measurements, just apple cider vinegar (probably a Tbsp), some cold lemon juice, and orange stevia mixed with water. It does not taste bad, surprisingly! To me, it just tastes like lemonade. I’m used to drinking water + lemon juice combo on mornings so this was just another addition to the regimen and a surprisingly pleasant tasting, in my opinion. Diabetes. The effect of vinegar on blood sugar levels is perhaps the best-researched and the most promising of apple cider vinegar’s possible health benefits. Several studies have found that vinegar may help lower glucose levels. For instance, one 2007 study of 11 people with type 2 diabetes found that taking two tablespoons of apple cider vinegar before bed lowered glucose levels in the morning by 4%-6%. This is one of the strongest points of drinking it. Blood pressure and heart health. Another study in rats found that vinegar could lower high blood pressure. A large observational study also found that people who ate oil and vinegar dressing on salads five to six times a week had lower rates ofheart disease than people who didn’t. However, it’s far from clear that the vinegar was the reason. Cancer. A few laboratory studies have found that vinegar may be able to kill cancer cells or slow their growth. Observational studies of people have been confusing. One found that eating vinegar was associated with a decreased risk of esophageal cancer. Another associated it with an increased risk of bladder cancer. Weight Loss. For thousands of years, vinegar has been used for weight loss. White vinegar (and perhaps other types) might help people feel full. A 2005 study of 12 people found that those who ate a piece of bread along with small amounts of white vinegar felt fuller and more satisfied than those who just ate the bread. Bloating is also heavily reduced. Not a weight loss factor per se, but psychologically lower bloating helps feeling like your diet is going places. Also, much much better digestion. Skin health – When diluted 50/50 it is often used as a toner for the face. A bath of apple cider vinegar is said to reduce the effects of sunburn. The vinegar soaked on a cloth and applied to sunburn may also be used. A reported treatment for warts is to soak the affected area for 20 minutes per day in a 50/50 mixture of vinegar and water. Dandruff – It is said to treat dandruff by destroying the fungus Malassezia furfur and restoring the PH balance of the scalp. Some people recommend applying a 50/50 mixture of water and vinegar, applying it to the scalp, and leaving it to dry. Others suggest applying a couple of tablespoons of straight vinegar to the scalp and leaving it on for an hour or two before rinsing. Apple cider vinegar is highly acidic. The main ingredient of apple cider vinegar is acetic acid. As the name suggests, it’s quite harsh. Apple cider vinegar should always be diluted with water or juice before swallowed. Pure apple cider vinegar could damage the tooth enamel and the tissues in your throat and mouth. One study found a woman who got an apple cider vinegar supplement stuck in her throat. She seemed to have suffered lasting damage to her esophagus. Vinegar has been known to cause contact burns to the skin. Caution should be used when applying as cider vinegar to the skin because it is very dangerous to the eyes. Well, as with anything – there are pros and cons. I guess I should make sure to not drink too much of it and ensure not to drink it straight (which would never happen anyway…. yuck). It’s probably best if I drink it on and off as I have been for the past month or two. I haven’t seen any major difference in how I feel or how I look. I do find that I go to the bathroom sooner though on the days that I do drink it, but it could be the combination of all kinds of things I do in the morning… so who’s a side effect of who? 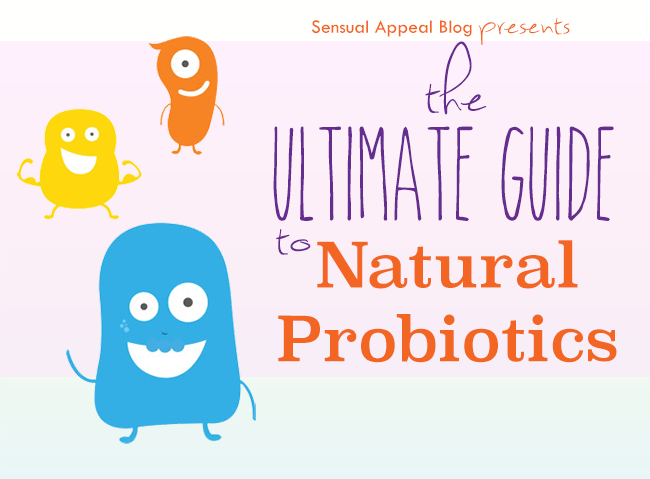 On a semi-related note: Check out my Ultimate Guide to Natural Probiotics. Have you jumped on the ACV wagon? What are your thoughts on ACV? We use apple cider vinegar mixed with Dawn on our dogs when they got sprayed by a skunk one time. It worked wonders. As for drinking, I have not done that yet. However, I have used it to cook with several times. Great post! I use apple cider vinegar for dressing in my salads. I never thought of having it in my water. Every morning, I make a hot water and half the juice of a lemon. I heard that detoxs your kidneys! I don’t know if it works, but I do it everyday! I”m going to try the water and vinegar before my dinner tomorrow to see how i feel. Thank you again for the great post! I have apple cider vinegar in my pantry… And I have tried it for my stomach issues but… It doesn’t really work for me 🙁 Nothing really works for me, ugh. I havhe been on the ACV band wagon for few years by now. I take 2TBS in a cup of luke warm water first thing in the morning on empty stomach with 1/4tsp of baking soda. As ACV is very acidic an can be harsh on the stomach, baking soda brings the drink to neutral PH level. ACV helped me with bloating and joint inflamation – no longer a problem. However, ACV must be raw with ‘mother’ containing all enzymes for full benefit, not a commercial type treated with heat. I think in US there is Braggs brand ACV. Thanks for the tips! What’s the difference between drinking it luke warm and cold? I’ve always drank it cold because I liked the taste better but wondering if there’s any particular reason everyone seems to do it with luke warm water. Good idea with the baking soda too. You do not want to mix ACV with baking soda. Changing the pH level with a substance such as sodium bicarbonate (baking soda) will completely alter ACV into something different. This will defeat the purpose of consuming this drink because it will not have all the benefits that pure ACV has. Baking soda and vinegar is the mixture used in the volcano experiment as a little kid. I consume my organic ACV diluted mixed with a little grade b maple syrup and organic cayenne pepper. Cayenne pepper helps increase metabolism. Btw my ACV has the mother in it too. The mother is a natural fiber. And another thing, baking soda is not natural, its chemically made crap. The healthiest choice is to consume all natural, non processed products. I’d stay away from it like that and recommend doing so – it’s fine to have in food, but having it in a context out of its intended (like as a daily morning drink) seems dangerous in the long-term, especially because of the potassium thing. Does that ring any Teri Schiavo bells? Her low potassium levels (due to a struggle with bulimia, in her case) caused the coma that left her brain dead and in a vegetative state for many years. Was she more attractive at the end? Was ‘skinny’ worth sacrificing her brain? I’m going to go with nooooo…. Great post Kammie!! As someone who used to use this regularly, I highly do NOT recommend drinking it every day. I have it once per week and that is enough.For one thing, people often mix it with lemon juice and if you are drinking vinegar and lemon and consuming it without a straw, um hello enamel damage! Your teeth will be ruined and will cause esophagus issues, no doubt. It may take a while, but it will happen. And I’ve found that once a week helps clear up my skin, but everyday or even 4 times a week and my skin breaks out like crazy. I guess it’s different for everyone, but for the most part I don’t think it should be consumed daily. But, that’s just my own opinion from experience and talking to my Doctor. Great insight, thank you for your thoughts! The drink sounds delicious, I do love acv and anything vinegary with sweet! lol. I couldn’t get into drinking much of it as I used to drink fresh lemon juice in hot water in the morning and sometimes one more time a day, for years and my dentist strongly warned against it. Anything acid, and high quality dark chocolate he said, are some of the worst things for your teeth. Well Im keeping the chocolate, so I stopped the lemon water in favor of just hot water, lol. ACV is something I have a love-hate relationship with. I used to drink it every morning but it was so nasty to me that I gave it up. Lately, I started using it on my face as a toner before bed and noticed that it does improve my skin as long as I don’t use it daily. I use ACV for cooking all the time, but haven’t thought about any other uses before. I recently started fermenting my own, so I might try that out once a week when it’s ready. Thanks! I love my morning cocktails with ACV! I’m glad you’re liking it so far. I also use it as a toner at night, applying a bit with a cotton ball. Thanks for hte link back! I have used ACV for the longest time now since high school now I am in my early thirties I use it for vocal recovery after damaging my self from blowing my vocals like a trumpet. Detox is wonderful with ACV however the head might ache a little. Weight loss is most def a + combined with working out. Skin great looking after two weeks of ACV use. I drink it in cold water a tblspn in a glass. I have grown a separate tongue for it as I crave the taste in water especially. Couldn’t stand water neat after a while. I also cook with it my meals turn out really tasty. I put teaspoons of Bragg’s AVC in my tea twice a day. I have been doing this for a couple of weeks and note no improvement in anything, weight, skin, hair, glucose, joing pain, cholesterol level….How long does it take? I do like the taste in tea…kinda like a Bud Lite. Bud Lite? That’s weird. Haha I never thought that. But as I mentioned in the post, it works differently for everyone but also you seem to be using it too much. Once a day is plenty or even use it less than that. Read the other comments in this post for some other responses from others.